The house is set over two floors, connected to both mains water and electricity and measures 280 sqm of construction. The main entrance leads directly into the hall way that has access to the living room and of which is open space with the dining area. The kitchen has eye level units and the flooring is parquet. There is also a little pantry room and the kitchen dor also has access to the back garden. There are three bedrooms, all of these are good sized and one of them has a fitted wardrobe. The house has diesel central heating, alarm and all the windows are single glazed. The property has two bathrooms, one of them is tiled and has a shower, toilet, bidet and pedestrial sink and the other one is a service bathroom and is partially tiled. There are internal marble stairs leading down to the basement which also has a garage, the space is very spacious and has a fireplace. This basement area is prepared to have a kitchen and a bathroom installed. The land of the property measures 1.410 sqm and of which is walled and fenced. The house is situated in a quiet area, there are other neighbouring properties in the vicinity though none impede your privacy. There is a petrol station with café and a mini-market within walking distance and a little chapel named Nossa Senhora da Piedade that is a religious tourist attraction which has a yearly festival in her honour and has the most amazing views over the town of Tomar. The larger town of Tomar is approximatley ten minutes walk and has a good variety of supermarkets, cafés, restaurants, banks, shops, pharmecies, health centres, sports centres, library, university, hospital, bus and train station, historic monuments and the very popular market every friday. 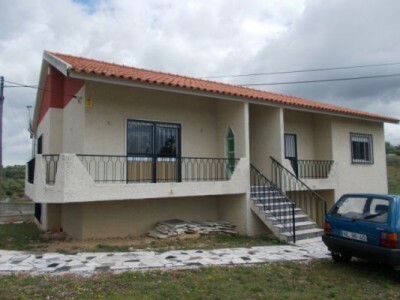 The closest airport to the property is located in Lisbon and is around one and a quarter hours drive by car. Lisbon airport is serviced by a variety of airlines. Operating regular flights into and out of the United Kingdom, other European countries and across thr Atlantic.